For a pack of 12, you can buy them for $9.95. 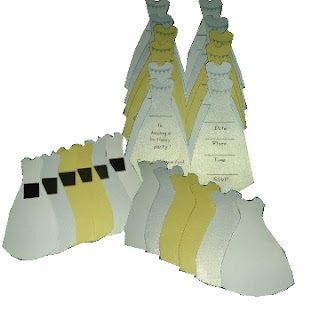 Gown-shaped cards are available in plain white, metallic white and yellow colours. Comes with a magnet at the back panel of the invite for easy display on the fridge. Gown-shaped cards measure 13cms(H) x 7cms(W single panel or folded). If card is open it measures 14cms (widest area in the lower section of the card). All you have to do is embellish them, write down the details inside the card and off they go to your special girl's invited friends. Click on the image above or click here to check it out and make a purchase if you think you will like it for that special girl in your life. For enquiries, click here.